I love crepes, they are so versatile and easy to make. I often make a stack of them ahead and then store in the freezer for when I need them. 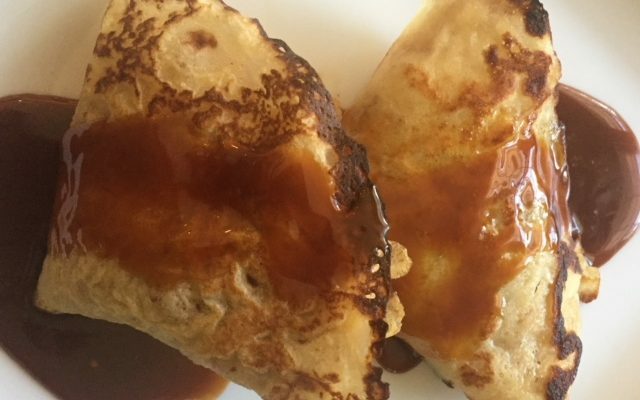 This recipe is for a sweet dessert crepe and can be filled with any cooked fruit you like such as apples, pears, plums, peaches or figs. In the summer I fill them with macerated berries that have been sitting in a liqueur such as Grand Marnier or Framboise and then top with homemade whipped cream. I suggest you cook the fruit of your choice with cinnamon, sugar and butter to your liking. If you have very ripe pears you might want to use less sugar than what is called for in this recipe. Peel, core and dice the apples. Melt the butter in a large skillet and saute apples for 3 minutes. Add sugar and cover, reduce heat to med-lo and cook about 3 minutes. Uncover continue to cook until softened about 3 to 4 minutes, stirring occasionally. Add vanilla, cinnamon and a pinch of salt and set aside to cool. Or mix the berries together with the sugar and lemon in a large saucepan and then cook until slightly softened. Combine the ingredients for the batter in a blender, blend for 10 seconds. Transfer to a sieve over a quart size measuring cup or pitcher. Allow batter to rest for 45 minutes in the refrigerator. Or you can chill it overnight. Melt a small amount of butter in a crepe pan and add one ounce of the batter to the pan. Swirl the pan right away to cover the bottom completely. Cook about one minute and then flip over. Cook the other side another 30 seconds or until golden. Transfer the crepe to a baking sheet and continue with the remaining batter. Heat the oven to 350. Butter a large gratin dish. Arrange crepes on a work surface and fill with a spoonful of apples, using a slotted spoon. Fold each crepe in half and then in half again to make a triangle. Arrange them in the dish overlapping slightly. In a medium saucepan combine the sugar with the water and cook stirring, over high heat until the sugar dissolves. Boil without stirring, occasionally brushing the sides down with a wet pastry brush until it begins to turn caramel colored, about 20 minutes. Remove from the heat, whisk in the butter, salt and cream. Return to the heat and allow the caramel to heat through. Drizzle half of the sauce over the crepes. Bake for 15 minutes. Serve with whipped cream and remaining sauce.